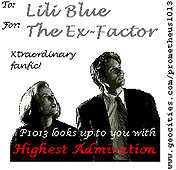 to my X-Files FanFiction Page. I wrote my first story in July 1998 and good feedback convinced me to write more! Summary: Scully faces a personal crisis and refuses Mulder’s singular way of helping her. This came out of my noticing that, if Mulder has been pretty obvious about his feelings towards his partner during all those years, Scully has remained enigmatic and distant, only showing a hint of jealousy at times. What if she didn't love him the way he did? Rated mild NC-17 - 137K - Category: S; A, MSR, S/other, M/other. Archived: 09/99 - Spoilers: Up to season 6. A story about growing up, taking and giving, making choices. Warning, the candy is sad but sweet. Archived: 12/98, revised: 12/14/98 - Spoilers: Emily, Fight the Future. Summary: Mulder and Scully slowly drift apart. A painful event reunites them after three years. What if the feelings were too overwhelming to be confronted? What if they were both too tired to fight for the things they really want? In the end, friendship painfully paves the road to 'home'. Rated PG-13 - 75K - Category: S; A, M/S UST then R, S/other. Archived: 07/98 - Spoilers: Up to Season 5, before 'The End'. Summary: A badly injured Mulder has to rethink his life, now that Scully takes care of him. A strongly confused Scully has to rethink her life, now that Mulder has become dependent on her. My baby, the first story I ever posted (July 98). It was finished but unedited at the time. Still, I got hundreds and hundreds (I stopped counting after a while) of positive feedback mails and no flames!! I couldn't sleep for a week. This story was a real labor of love and I put all my heart into it, if not a tiny drop of inspiration. Rated PG-13 - 5K - Category: V; very Angsty, M/S UST implied, S/other. Archived: 10/98 - Spoilers: A slight one for 'Duane Barry'. Summary: A short vignette about Mulder's fears realized. A really, really dark piece, in a romantic sort of way. You've been warned. Rated PG - 5K - Category: V; A, M/S UST implied, Muldersadness. Archived: 12/98 - Spoilers: "Emily", slight one for "Redux II". Summary: Mulder. Christmas eve. Need to say more? Rated mild NC17 - 112K - Category: Series AU; A S/other, M/other, M/S UST then R, character death (?). - Archived: 10/98 - Spoilers: None. Summary: As Scully is about to make big changes in her life, something out of the ordinary happens to Mulder that forces him to make HUGE changes in his. This was the first story I wrote in English. It featured original characters and when I entered the FanFic world, I adapted it to Squirrel and Moose. Rated R - 44K - Category: Series AU; A, M/other, MSR, character death (?). Archived: 11/98, revised 9th January 99 - Spoilers: None. Summary: Follow-up to "A Metallic taste I". Scully, the mortal, struggles in the world of Mulder, the Vampire. I had to do a sequel. I just had to. And to heal your hearts, aching by the end of MT2, I'm currently working on the next part. Rated R - 57K - Category: Series AU; S/other, MSR. WARNING: Characters death, Extreme Angst. Archived: 05/99. - Spoilers: None. Summary: Follow-up to "A Metallic taste I" & "II". Last and final part in the "Metallic taste" series. Mulder has now on his conscience the future of Dana, fledgling Vampire. Rated PG - 17K - Category: S; H, M/S UST. Archived: 10/98 - Spoilers: None. Summary: Mulder and Scully through the eyes of a Small One. This idea came to me while watching a report on cats on a German channel. I only had a vague idea of what they were talking about so I focused on the cats' behavior. BT was born. Rated PG-13 - 13K - Category: S; H, MSR. Summary: The new adventures of Mulder's cat Bad Timing (aka B.T.). BT is being bad in this one and she just has to express her territoriality on Mulder one more time. Rated PG - 18K - Category: S; H, MSR. Archived: 02/99 - Spoilers: None. Summary: Mulder's cat, B.T. (Bad Timing), introduces new Small Ones in the Mulder family. On how BT turns into a Mommy.